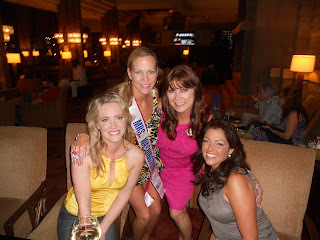 Mrs. Washington America 2010 - Carla Richards: Family and Friends Arrived! So happy to see my boys! So excited! My handsome hubby and adorable boys arrived today along with my pageant sisters Elizabeth Larsen - Mrs. Washington 2009 and Lisa Bluhm - Mrs. Pacific Northwest. I have a great cheer squad! Well, tomorrow is another big day - prelims in costume, bathing suit and evening gown. I just hope and pray to my best and the rest is up to God! Either way, I already feel like Mrs. America just to have had this amazing experience!